I was drawn to the golden orbs of the horsenettle while hiking last week in an old field on the edge of an orchard. Bright spots of yellow against faded, brown grasses and dried wildflowers, I decided to take a stem home to paint. Upon identification, I was not surprised to learn that the plant is invasive and unwanted, as are many plants that grow in the weedy margins of fields. Still, I love the way the fruit drapes from the tendrilous vines and there is something ironic, yet masterful in a poisonous plant that protects itself with thorns. 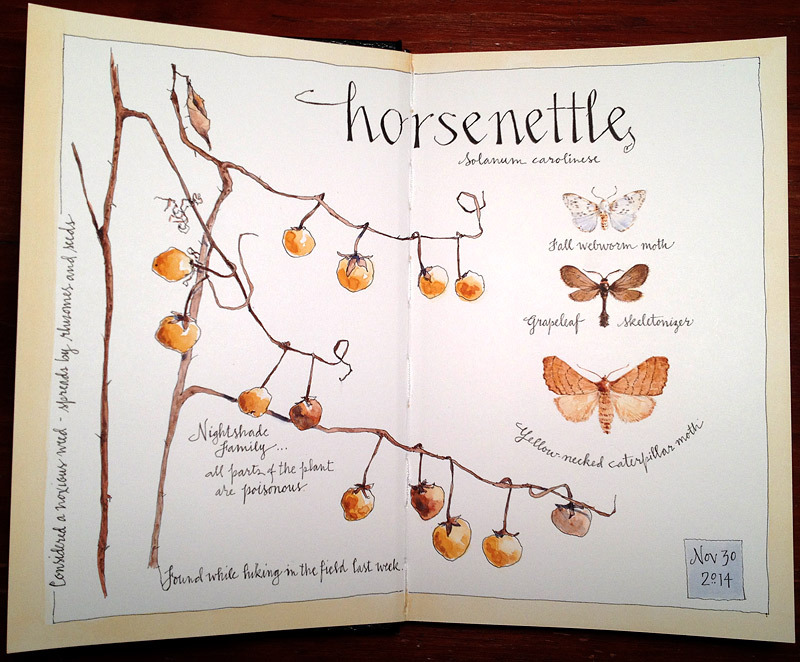 Once I painted the horsenettle, I wanted to round out the page with other undesirable beauties of fields and orchards. 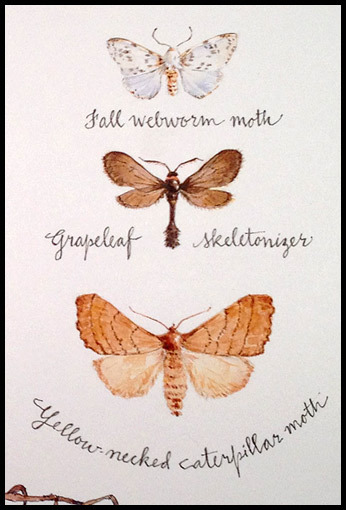 This trio of moths is found in the Northeast: the yellow-necked caterpillar moth is destructive to apple trees, the larval grapeleaf skeletonizer does just as its name implies, and the fall webworm caterpillar, while not particularly damaging, forms unsightly nests on tree limbs. This entry was posted in Journal, Watercolor and tagged Autumn, garden & flowers, Indian Ladder Farms, invasive species, moths, nature, watercolor by Jean Mackay / Drawn In. Bookmark the permalink. Those are some really beautiful sketches. Every page in your books in so beautifully composed Jean. Thanks Shari! I don’t typically plan a page like this…I just keep going until I have the sense that the elements have come together and the composition works.